Chinese stir-fry dishes are easy to prepare and cook. If you like variation on taste, it´s great knowing that most meat and vegetable combinations work well together. 1. Place the salt, freshly ground black pepper, sesame oil and 2 tbsp of Chinese cooking wine in a bowl and marinate the beef tenderloin for at least 15 minutes. Marinating overnight in the fridge will make it more flavorsome. 2. 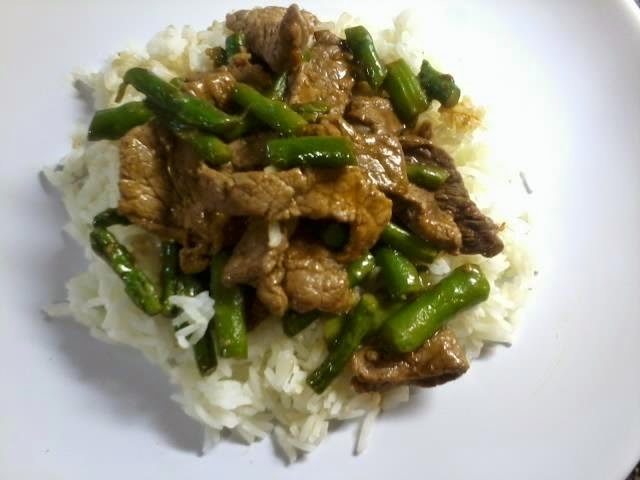 Heat the oil in a wok or heavy based frying pan and stir fry the beef in high heat in batches for 2-3 minutes. Remove the beef from the wok and set aside. 3. Add the oil stir fry the ginger and onion until soft. 4. With the asparagus, break at the spot where it becomes hard and discard. Cut the asparagus into short pieces and stir fry for a minute. 5. Add the beef with soy sauce, oyster sauce and Chinese cooking wine. Stir fry for 1-2 minutes. 6. Serve immediately with freshly cooked basmati or jasmine rice.